This blog post originally appeared on Politics for Tomorrow. 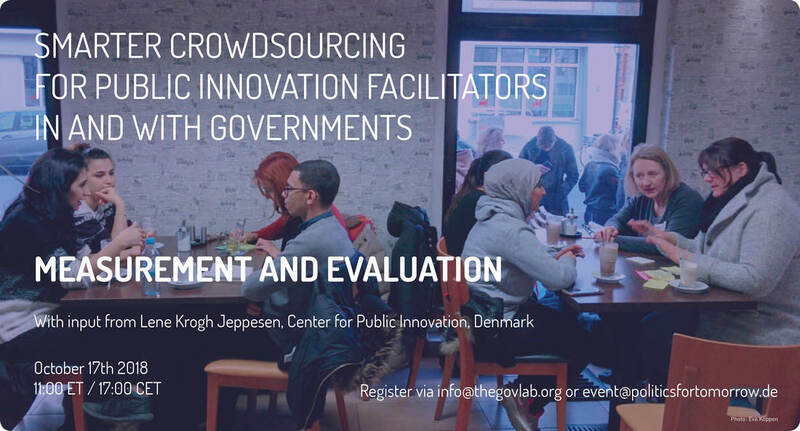 On October 17th 2018, the GovLab and Politics for Tomorrow convened a global expert exchange focussing on measurement and evaluation. The discussion was led with an input by Lene Krogh Jeppesen from the Danish Center of Public Innovation. The main takeaway from the online conference on measurement and evaluation was to differentiate “numbers“ and “judgement“ more clearly. Many participants were interested in how to combine innovation processes with an adequate evaluation practice as soon as starting an innovation project. Furthermore it became obvious that developing evaluation skills should be part of innovation training to better understand and show the impact of our work. A summary of the conversation and the slide presentation of Lene Krogh Jeppesen can be downloaded below. The next online conference is scheduled for January 16th, 2019 and will focus on incentives for public innovation learning. Hosted by Professor Beth Noveck, Director of the GovLab in the U.S, and Caroline Paulick-Thiel, Director of Politics for Tomorrow in Germany, the online conferences bring together experienced experts who are all currently working on facilitating or teaching innovation processes in the public sector, either on a city-level, national, or global scale. The purpose of these meetings to spark mutual inspiration and learning by convening a quarterly expert exchange, operating under the Chatham House Rule.